Oak Meyer Gardens (OMG) is a neighborhood homes association located in the historic Country Club District of Kansas City, Missouri. The neighborhood boundaries are 63rd & 69th streets on the North and South, and Holmes & Oak on the East and West. 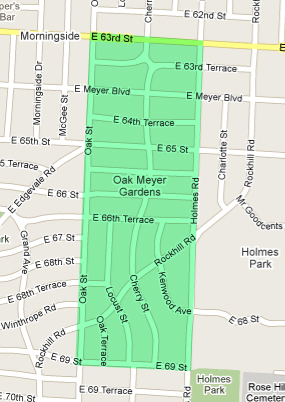 Oak Meyer Gardens is bound by 63rd & 69th streets on the North and South, and Holmes & Oak on the East and West. You may download a copy of the Oak Meyer Gardens declaration here (pdf). You may download a copy of the 2018 Amended Bylaws-with-signatures (pdf). You may download a copy of the Oak Meyer Gardens by-laws here (pdf). You may download a copy of the Oak Meyer Gardens restrictions here (pdf). Residents of the Oak Meyer Gardens Homes Association freely elect neighbors to serve as officers on the neighborhood board. View a list of the current officers here. This is an interactive map of all 61 common-area markers maintained by our homes association.